More commonly known as 3D printing, additive manufacturing is a process that uses a 3D printer to print a 3D object by adding material layer by layer. There are several techniques for printing, including melting material, such as plastic, and pushing it through a heated nozzle, fusing powders together to create an object, and laying down layers of resins, waxes, or other materials to build up a 3D object. First, you create a 3D model on a 3D modeling program or scan an object with a 3D scanner. There are many how-to guides available and the software comes with instructions on creating models. Once you have created your design, save the file using an STL or OBJ file format, or other format compatible with the printer. 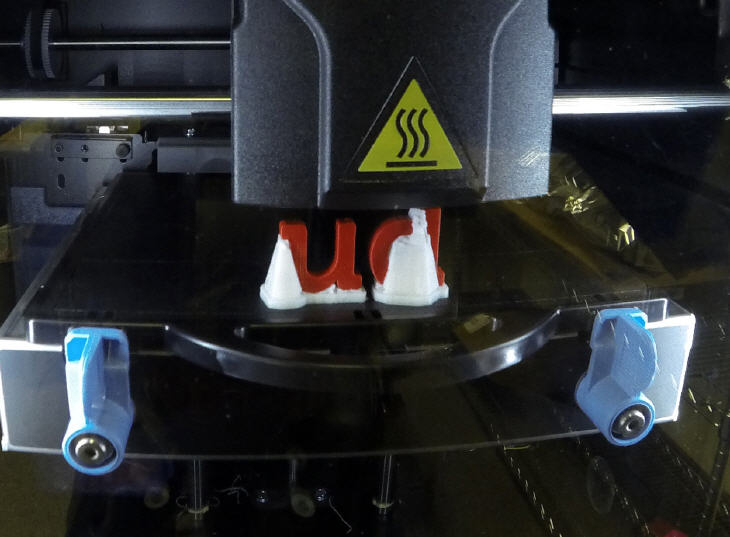 Most 3D printers come with software to process and convert the files, preparing them to print. The printer’s software slices the model into sections and determines how the printer will print each layer of the object. This process typically takes between 0 to 30 minutes depending on the geometry of the object, the 3D printer, and the speed of the computer. Once this process is done, the printer melts or fuses the material and prints the object one layer at a time. You can watch the process of the object being printed, which is a pretty neat to see. Printing can take a few minutes or several hours depending on the size and complexity of the object being printed.